I’m not sure where to start with this film, which, even though very similar to Alexandr Sokurov’s Russian Ark , shot in a single long-take, reminded me of so many things except for this particular film. People’s Park and Russian Ark have a lot in common, but there are certain aspects of People’s Park, which actually made me feel uncomfortable while watching it which had never been the case with Russian Ark. People’s Park is set in a park in Chengdu, China. Shot in a single long-take of around ninety minutes, the camera travels through the landscape and records people’s activities during their leisure time. This is one thing that sets off the film strongly from Sokurov’s counterpart. The directors Libbie Cohn and JP Sniadecki have set up a seemingly Tarr-esque camera, a camera which has its own life, its own objectives, its own trajectory. It reminded me of Daniel Frampton’s filmind, a concept I have found mind-blowing when I read Frampton’s book Filmosophy and which I still like, especially when it comes to Béla Tarr and his use of an “independent” camera, which appears to follow nothing but its own plan. But, in contrast to the uses of an independent camera by Tarr and Sokurov, Cohn and Sniadecki’s camera feels voyeuristic. While Sokurov’s camera is a playful tool to record a walk through a museum, for example, People’s Park feels like something one is invited to watch but which one shouldn’t watch perhaps. The extremely smooth camera is on a level of height with that of a child. The people with whom we cross paths, look down on us. The only ones that look straight into our virtual eye are the children we meet. As for the adults, we look up to them from time to time. We cross a lot of people who don’t know why we look at them, why we seem to be interested in their having a tea, in their enjoying themselves on a free day. Some people even look as if they have never seen a camera before. Indeed, why are the directors filming this and why do they force us to watch this? This could be said with other slow films, too. But there is no film I’m aware of in my repertoire which nagged me so strongly with those two questions; for one specific reason. One thing that immediately came to my mind, after only a couple of minutes, was the ethnographic studies done with the help of film in colonised countries. I couldn’t help but think of those early films colonisers have made in far away worlds to record natives and show those portraits to their (colonising) people at home. The Chinese you see in People’s Park had very similar looks in their faces, if not the exact same look we know from early colonial film. It made me feel very uncomfortable and I wonder what the actual aim of the film was. Of course, the historical context today is different. And yet, and yet… I’d be very interested in seeing an analysis of the relationship between colonial film and People’s Park. Two more things which came to mind while watching the film. 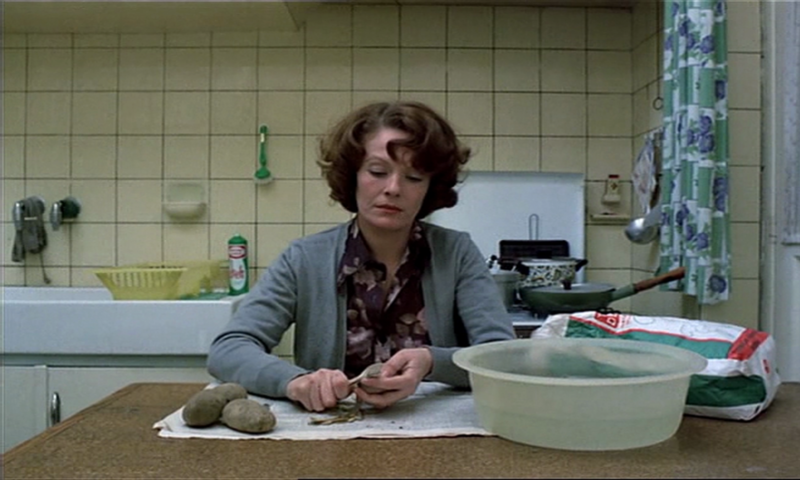 There are definite links to Chantal Akerman’s D’Est (1993), which is a superb film and was a journey through memories for me, having been born into a communist system which then fell apart shortly afterwards. And then there is this eerie feeling, just like in Akerman’s film, that there is a ghost taking us on a journey. For some reason I felt a ghostly presence throughout the film. I think it was the incredibly smooth camera, the floating movements, which had me believe that there is an otherworldly presence. Maybe this is the reason for the questioning looks on the protagonists?